Når man vurderer samfunnsforventninger og tradisjoner i forskning, er antagelser ofte et integrert aspekt – spesielt i organisasjonsstudier. Målet for denne vitenskapelig antologien er å analysere, tydeliggjøre og avmystifisere antakelser om forskning og hvordan organisasjoner fungerer. Boka er tverrfaglig i form og innhold, og tar for seg forskningsprosessen, grunnleggende antakelser i forskningen samt mulige fallgruver som både unge og mer rutinerte forskere burde huske på. 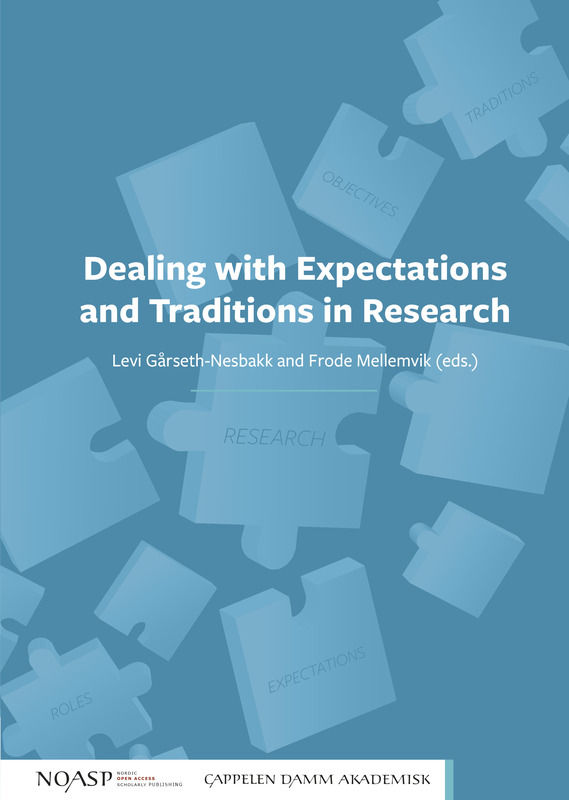 Dealing with Expectations and Traditions in Research vil være av interesse for forskere på alle nivåer, inkludert doktor- og mastergradsgradsstudenter. Levi Gårseth-Nesbakk er ph.d., førsteamanuensis ved Handelshøgskolen, Nord Universitet og underviser i tillegg ved Handelshøyskolen i Trondheim. Gårseth-Nesbakk skrev doktorgrad om utprøving av periodiseringsprinsippet i statlige virksomheter. Han har i flere år undervist innenfor regnskap, budsjett og andre tema innen økonomistyring, med tilhørende forskningsinteresser og publikasjoner. Frode Mellemvik er direktør ved Nordområdesenteret for Næringslivet og professor ved Handelshøgskolen i Bodø. Mellemvik er dr.oecon. fra Norges Handelshøyskole. Doktoravhandlingen var innenfor fagområdet regnskap. Mellemvik har skrevet og gitt bidrag til mange bøker og artikler tilknyttet fagområdet regnskap og økonomistyring samt innenfor utdanning, forskning og næringslivssamarbeid, ikke minst med Russland. Han har arbeidet ved akademiske institusjoner i Europa og USA og er æresdoktor og æresprofessor ved utenlandske universitet. Mellemvik har også i praksis arbeidet med ledelse og styring og har vært rektor ved Høgskolen i Bodø i 10 år. Han har vært med og er med i flere styrer og råd, for tiden bl.a. i styret for det akademiske nettverket Comparative International Goverment Accounting Research, Center for High North Logistics og Innovasjon Norge Nordland, leder av styret for Helgelandssykehuset, i representantskapet for Nordlandsbanken, i styret for forskningsprogrammet Petrosam, Norwegian-Ukrainian Camber of Commerce og Gigante Petjenga og i rådet for Norwegian-Russian Camber of Commerce. Mellemvik har også deltatt i flere offentlige utredningsarbeider og var medlem i regjeringens ekspertutvalg for Nordområdene. Salvador Carmona is a professor of Accounting and Management Control at IE Business School – IE University. Carmona currently serves as Rector of IE University, and he is a Past President of the European Accounting Association. Carmona holds editorial board positions in 14 international journals and has served as editor of European Accounting Review and as senior editor of Oxford Research Reviews. Salvador’s research focuses on the organizational and social aspects of accounting systems. Barbara Czarniawska is a Senior Professor in Management Studies at GRI, School of Business, Economics and Law at University of Gothenburg, Sweden. Doctor honoris causa at Stockholm School of Economics, Copenhagen Business School and Helsinki School of Economics, she is a member of the Swedish Royal Academy of Sciences, the Swedish Royal Engineering Academy, the Royal Society of Art and Sciences in Gothenburg and Societas Scientiarum Finnica. Czarniawska takes a feminist and constructionist perspective on organizing, recently exploring the connections between popular culture and practice of management, and the organization of the news production. She is interested in methodology, especially in techniques of fieldwork and in the application of narratology to organization studies. Recent books in English: A Theory of Organizing (second edition, 2014), Social Science Research from Field to Desk (2014) and A Research Agenda for Management and Organization Studies (edited, 2016). Sten Jönsson is professor emeritus in Business Administration, especially Scandinavian Management, at GRI, Gothenburg Research Institute at the University of Gothenburg School of Business, Economics and Law. He received his PhD in 1971 and was appointed professor of Accounting and Finance in 1976. He is Dr. hc at Turku School of Economics and was awarded the “Anthony G. Hopwood Award for Academic Leadership” by the European Accounting Association in 2016. Jan Mouritsen is a professor in the Department of Operations Management at Copenhagen Business School, Copenhagen, Denmark. Mouritsen’s interests concern the role of management technologies and management control in various organisational and social contexts. His research focuses on the sociology of calculative arrangements and the constitution of organisations, values and production drawing on practice based theory. His interests include intellectual capital and knowledge management, technology management, operations management and management control. He has published in journals including Accounting, Organizations and Society; Management Accounting Research; Scandinavian Journal of Management; Accounting, Auditing and Accountability Journal and Critical Perspectives on Accounting. Key research publications include Kornberger, Martin; Pflueger, Dane & Mouritsen, Jan: Evaluative Infrastructures: Accounting for Platform Organization, Accounting, Organizations and Society, 2017, 60(7): 79-95. Mouritsen, Jan & Kreiner, Kristian: Accounting, Decisions and Promises, Accounting, Organizations and Society, 2016, 49 (1): 21-31. Mouritsen, J. & Thrane, S., 'Accounting, Network Complementarities and the Development of Inter-organisational Relations' in Accounting, Organizations and Society (2006, vol. 31, no. 3, pp. 241-275). Olov Olson has been a professor in business administration, especially accounting, since 1988. He was first employed by the Norwegian School of Economics, and since 1998 by the School of Business, Economics and Law at the University of Gothenburg. Inger Johanne Pettersen er ansatt ved Trondheim Økonomiske Høgskole og ved Handelshøgskolen i Bodø. Pettersen er professor i bedriftsøkonomi, og hun har i mange år arbeidet med styringsutfordringer i helsesektoren.